Remember, remember, the fifth of... wait, December? That's not right. Who is the man who hides his scarred face behind a mask? Hero or madman? Liberator or oppressor? Who is V - and who will join him in his plot to destroy the totalitarian regime that dominates his nation? "Voila! In view, a humble vaudevillian veteran, cast vicariously as both victim and villain by the vicissitudes of fate. This visage, no mere veneer of vanity, is a vestige of the vox populi, now vacant, vanished. However, this valorous visitation of a bygone vexation stands vivified, and has vowed to vanquish these venal and virulent vermin vanguarding vice and vouchsafing the violently vicious and voracious violation of volition. The only verdict is vengeance; a vendetta held as a votive, not in vain, for the value and veracity of such shall one day vindicate the vigilant and the virtuous. 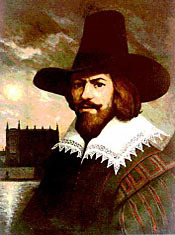 Verily, this vichyssoise of verbiage veers most verbose, so let me simply add that it's my very good honour to meet you and you may call me V."
V, the bearer of the titular vendetta, dresses himself as Guy Fawkes, the only man to ever enter parliament with honorable intentions - he famously tried to blow up the place up in 1605. He failed, so he's considered a traitor; if he'd succeeded, he'd have been a national hero. Fawkes' desire to overthrow his government matches with V's own drives, so the connection is a smart one. Unfortunately, there's one major connection that NECA missed. Though he's come out at (nearly) the same time as Cult Classics 5, V (whose name is also the Roman numeral for "five") is not part as that series - or even that line, at all. This is just a standalone figure, branded and marketed by himself, which is part of why it took so long for him to show the hell up: stores already had a full complement of NECA movie toys; they weren't about to buy another. Despite his tardy arrival, V is an excellent film figure. Articulation is above average, the sculpt is great and the paint, such as it is, is good. There's really only so much you can do with a character who dresses in all black, after all. The white of his mask is crisp, and the pink blushes on his cheeks and lip are subtly faded, not glopped on. There's a bit of grey to bring out the wrinkles of his brow and around his eyes, and the underside of his chin is white, concealing any hint of his identity. His belt buckle looks like aged metal, while the notches for his daggers have a brighter polish. For absolutely no reason, the soles of his shoes have a pink fleshtone painted where no one will ever see. Even by NECA's already-elevated standards, V moves well. His head, shoulders, wrists and hips are all balljoints, and he has swivels at the top of the boots. His waist is either a peg or a balljoint - it seems to have a little more wiggle room than a normal swivel would, but that could be attributed to a loose fit. So think of it as a peg joint, but don't be surprised if he tilts a skosh, too. If this guy had knees and elbows, he'd be a ToY contender, but with absolutely straight limbs, there's only so much posing you can do, even with the balljoints. By this point, is there any question that NECA will deliver a good sculpt? No, not really, and Michael Locasia doesn't disappoint here. V's shirt has a rough, woven pattern, while his pants are smoother. The gloves and boots have the look of aged leather, with intricate cracks all over. For once, NECA's tendency to make hair look like a wig works out okay, since V does wear a wig. No complaints about the likeness, either, since they were just following a stylized Guy Fawkes mask. 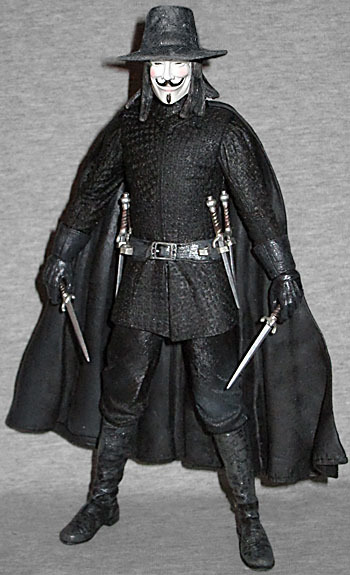 As for accessories, V has a removable hat (which ends up just a little oversized on him) and six daggers. 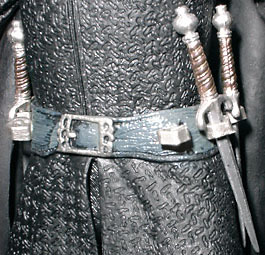 The daggers fit into loops on his belt - the prototype showed two loops for each knife, but the final thing has only one per. The knives fit into the belt and into V's hands well, though you might want to pry his fingers open a bit to get the pommel through. I know Monkey Boy bought V, and has had a really tough time with the daggers breaking, so be careful. That hasn't happened to mine, but you never know. 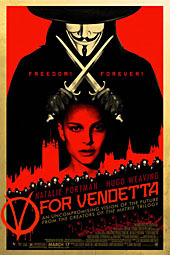 Despite Alan Moore's pissy complaints, V for Vendetta was really an excellent film. The acting was good all around, the plot tighter than the graphic novel, and the message was never diluted. Some people read a straightforward current political allegory into the story, but that says more about their own mindset than the film - or maybe how wrong politics are going right now. This is not what Moore called an "American liberal fantasy of someone with American liberal values standing up against a state run by neoconservatives" - V For Vendetta is about fascism, it's about anarchy, and it's about the entire world, not just England (or America). The movie's message wasn't "vote Democrat," it was "overthrow your government and learn to live without." Not U.S. government - all government. It's strange that it's NECA that gave us this figure, not DC Direct. V for Vendetta (the comic) is owned by DC Comics, and the movie came from Warner Brothers. Still, it's not like NECA did a bad job - far from it. V is a very good figure, though very hard to find. Make sure the daggers are all okay before you buy, but this is one terrorist worth inviting into your home.